A UN Militia in Your Community? Obama Requests 15,000 Russian Troops For “Upcoming” Disaster [June]: "An unsettling report prepared by the Emergencies Ministry (EMERCOM) circulating in the Kremlin today on the just completed talks between Russia and the United States in Washington D.C. says that the Obama regime has requested at least 15,000 Russian troops trained in disaster relief and 'crowd functions' [i.e. riot control] be pre-positioned to respond to FEMA Region III during an unspecified 'upcoming' disaster." "...these Russian troops would work 'directly and jointly' with [DHS Director Janet Napolitano] Federal Emergency Management Agency (FEMA), part of whose mission is to secure the continuity of the US government in the event of natural disasters or war. ...FEMA Region III, the area Russian troops are being requested for, includes Washington D.C. and the surrounding States..."
In the near future, could the United Nations actually place its own police force in our communities to quell local conflicts? Worse yet, would it have authority to deal with the mere risk of such a conflict? Would this intrusive militia bypass U.S. authorities in order to fulfill any UN Security Council command? According to George Archibald, who reported this incident in his Washington Times article, "White House backs standby U.N. army," the UN official indicated that Canada and the Netherlands are primary backers of this UN force. Thats true, but the USA has been actively pursuing this goal together with Canada. might be considered too "intrusive" for use by an inter-governmental organizations. Even if these political hurdles can be overcome, acquisitions of these capabilities face enormous financial obstacles . . . . Does that statement sound familiar? A mere Constitutional objection cannot stop these visionaries. Nor can national laws or public opinion. After all, laws can be reinterpreted and public opinion manipulated. As long as the mainstream media can win either the consent or the silence of the masses, Clinton and his team of change agents can continue to write life-changing rules and regulations that bypass Congress. .This would be particularly useful in low-level but dangerous conflicts.
. [C]ivilian police performed indispensable functions in monitoring and training national police forces. They could play a major role, through assistance to local police forces, in restoring civil order, supporting the rule of law, and fostering civil reconciliation." Interagency cooperation within our government"
Keep in mind that "international cooperation" means working with NATO and the UN. Three of the four points above were covered in the report mentioned earlier, Towards A Rapid Reaction Capability for the United Nations. The list of excerpts at the end of this report broadens our view of the vast bureaucracies, monstrous power, and arrogant ambitions that drive the UN agenda and its worldwide network of disciples every closer to Maurice Strongs vision of "global governance". To speed the process, the United States is expected to contribute troops as well as its enviable expertise in surveillance and reconnaissance technology. American taxes would fund and arm a global management system that aims to crush Christianity, Western culture, capitalism, and the US Constitution. 7. Controlling the flow of information is vital to the envisioned global management system. To this end, each nation must fund and implement its part of the massive global information and monitoring system. In the following section of Towards A Rapid Reaction Capability for the United Nations, notice the reference to Information Management. may have great strategic potential. has obvious applicability to monitoring, surveillance and control missions. share the data with international bodies such as the United Nations. 8. A crisis need not erupt before the UN militia begins its work. In fact, one of its major responsibilities would be to monitor human rights violations around the world. If that doesnt concern you, please read our reports on Executive Order 13107: Human Rights Implementation and The UN Plan for Your Mental Health. "Successful early warning requires unrestricted access to data that is freely available for exchange. Ultimately, all resulting information must be credible, and emanate from a single officially designated authority. In other words, the U.S. must provide the UN with all the data needed to assess potential conflict of any sort anywhere. Among the conflicts the UN police are being trained to resolve are human rights violations. In the eyes of UN leaders, any group that violates the UN standard for politically correct beliefs and values could be "at risk" of creating conflict.13 Would non-compliant people be among the risk factors that could trigger the "early warning systems"? "Current early-warning systems could be substantially strengthened by working towards an element of 'automaticity' in early-warning arrangements. Ideally, as Jessica Tuchman Mathews, of the Council of Foreign Relations, New York has suggested, "The UN should develop an automatic system of responses . . . . The key is that a certain set of findings would trigger a set of predetermined responses for rapid reaction.. . . .
would not have to await the lengthy domestic processes of each Member State before a critical mass of police forces is assembled.... a permanent force could be trained to the high standards which the UN should demand. . . .
is based on standby arrangements for nationally-based units linked to a UN operational headquarters. The United Nations may well position its "highly trained" Volunteer Force armed with Americas latest surveillance and reconnaissance technology in our midst. Such an action would fit the vision of many US leaders who, for political reasons, prefer to let the UN make such unpolular choices for them. If this happens, and if this Force must carry out Security Council orders that our Congress would forbid, there will be no earthly place to hide from tyrannical leaders. Together, the people prayed, followed God's instructions, and won the war in a mighty demonstration of the power and faithfulness of our God. 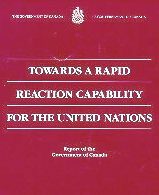 1.Towards a Rapid Reaction Capability for the UN (The Government of Canada, 1992), p. 62. 2. Our Global Neighborhood, The Commission on Global Governance (Oxford University Press, 1995), 110-111. 3. George Archibald, "White House backs standby UN army," Washington Times, April 23, 1998. 4. Towards a Rapid Reaction Capability for the UN , page 63. 7. See Local Agenda 21. 8. Al Gore, Earth in the Balance; Ecology and the Human Spirit (Houghton Mifflin, 1992), p. 274. 11. You can read about this UN conference, and the global sisterhood that led it, in chapter 9 of A Twist of Faith.